Adina Kalet, MD, MPH, a former Arnold P. Gold Professor of Humanism and Professionalism, has devoted her career to ensuring that public investment in health professionals training leads to improved health outcomes. 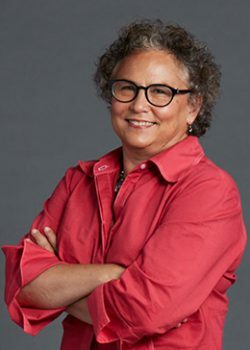 A primary care internist by training, she is founding Director of Research for both the Program on Medical Education and Technology and the Research on Medical Education Outcomes units at New York University. “Throughout my whole career, I’ve been very interested in the importance of training physicians—people—to be hearty and courageous and wise in their day-to-day practice because every day in a physician’s life is just a whole series of challenges. Everything is an intellectual challenge but often it is also a moral and professionalism challenge. You’re always making moral decisions day in, day out. In the early 2000s, I led a task force to rethink our assessment of medical students. I didn’t have much in the way of resources so the dean of student affairs sent me three medical students who had come to him because they were incensed with the way their colleagues were behaving in class. They were annoyed with the immaturity of their classmates from big things like cheating on exams to little things like behaving entitled and immature around faculty… basically they were all behaving like high school kids. These three students had all spent some time in the working world before coming on to medical school and therefore had been in professional environments, most of their classmates had gone directly from college to medical school. We realized that most medical students don’t think of themselves as physicians until they hit the clinical working environment. They don’t yet connect how they behave with what they say their values are and what they believe ethically before they put white coats on and step onto a hospital ward. We realized that if we don’t prepare them for the transition to practice, they’re not going to have the skills to recognize challenges to their professionalism or be able to recognize when they’re being challenged on a moral or ethical level. So these three students and I formed a committee called the ‘professional development committee’ and generated a curriculum for the medical students by the medical students for all the pre-clinical students. The curriculum was based on cases that we called ‘Ripped From the Headlines’ (like Law & Order) in which senior medical students told stories about things that routinely came up—ways that they were challenged. These weren’t necessarily high-profile, bad situations. Sometimes these were just minor things. Like, whether or not you admit you have never done something before you go to do it for the first time on a patient? or what to do or say when you or somebody else makes a racist or a sexist comment? or how you deal with a patient who is sexually inappropriate? We dealt with some of the classic ethical dilemmas but also with the day-to-day simple but challenging things. For instance, lying on rounds: If you were supposed to have done something that morning but you didn’t do it, do you tell the attending that you didn’t do it? Or do you say you did and then go do it? We wrote these cases up and trained senior medical students to facilitate case discussions with junior medical students, which they ran in a closed room with no faculty present. Our goals were to sensitize students to the challenges they might face and help them think through how they would respond. It was great. Students disagreed about what to do because they had different points of view on their roles and responsibilities. This gave us the opportunity to talk openly about when you become a physician. The curriculum also had the impact of arming students not just for their own decision-making but to be each other’s counsel. Having the medical students take a high profile in the professionalism curriculum was really wonderful because it wasn’t perceived as a parental figure coming and saying this is how you should behave, a situation that adults would naturally balk at. It became more about how the students would hold each other to these high expectations. Through this process they become responsible for each other, practicing professional self-regulation, which is a defining principle of medical professionalism. And this process gives them a role early on in their training. Now as someone involved in remediation of unprofessional behavior, I say to students, it’s not just about knowing the content of The Physician Charter (I always hand them the Charter). The hard part is how do you hold yourself to those very high standards under the kind of pressure that physicians feel as individuals? It’s not about slapping somebody on the wrist if they do something bad, it’s about getting them to become aware of why they did what they did and what principle was violated. Then we can give them an opportunity to really think about why that happened and how they can protect themselves from letting it happen again. And this does not just apply to professionalism but also to the process by which clinical decisions are made. The bottom line is—professionalism is demonstrating that you are a conscientious, thoughtful, wise person and even if you make a dumb mistake, you do the things that professional people do: you apologize, you address any harm that was caused, you do what you can to make sure that you don’t do it again and you take responsibility for each other. It’s more of a way of being and a set of character traits that you highlight and develop.